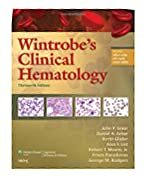 With the 13th edition, Wintrobe’s Clinical Hematology once again bridges the gap between the clinical practice of hematology and the basic foundations of science. Broken down into eight parts, this book provides readers with a comprehensive overview of: Laboratory Hematology, The Normal Hematologic System, Transfusion Medicine, Disorders of Red Cells, Hemostasis and Coagulation; Benign Disorders of Leukocytes, The Spleen and/or Immunoglobulins; Hematologic Malignancies, and Transplantation. Within these sections, there is a heavy focus on the morphological exam of the peripheral blood smear, bone marrow, lymph nodes, and other tissues. With the knowledge about gene therapy and immunotherapy expanding, new, up-to-date information about the process and application of these therapies is included. Likewise, the editors have completely revised material on stem cell transplantation in regards to both malignant and benign disorders, graft versus host disease, and the importance of long-term follow-up of transplantation survivors. The textbook comes with an online, interactive e-book that includes all text, figures, and the full reference list for each chapter. Also in the e-book are two appendices that review the clusters of differentiation (CD) molecules and lab values and photomicrographs of the blood of various species. Along with these tools, the authors plan to post frequent updates to the e-book.